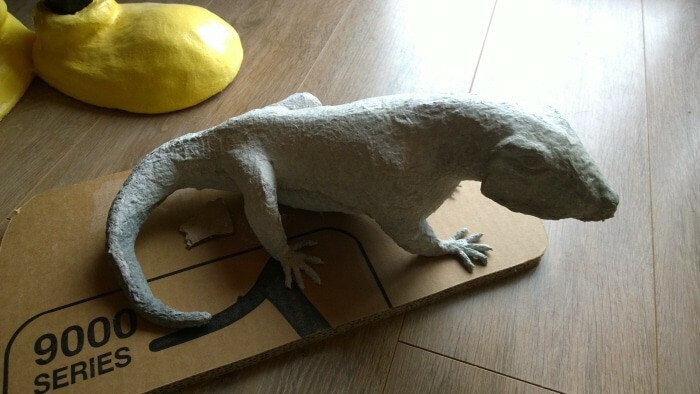 Today we have a guest post from Marilyne, who has some very nice sculptures-in-progress to show us in addition to her Chameleon — and she also has a request for suggestions at the end of her post. Before we get to her post, I just wanted to give you a link to a YouTube channel I found this morning that shows a fellow making realistic dinosaur sculptures. 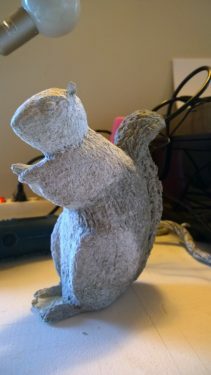 Most of them are made with epoxy clay, but he says he’s now moving to paper mache because it’s so much less expensive. It looks like he’s actually a dinosaur expert, so if you have any interest in making a sculpture of one of the long-departed beasts, you might want to watch a few of his videos. Hello everybody, my name is Marilyne, I’m French and I’ve always been inspired by nature, animals and creations of all kinds. At the beginning, words were my “weapons,” I used to write stories, lyrics, poems. I still do but recently, a big change in my life made me realize it was time to believe in myself. So, new home, new life, and challenges! 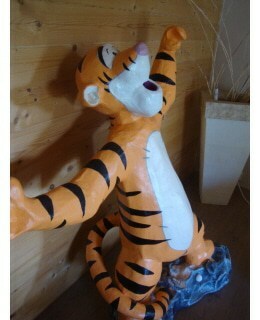 The first one was to build a big and famous tiger for my best friend’s son, that was when I discovered paper mache. Then, I tried to find what I really wanted to make. Researches on the web led me to this great website, I tried different techniques and recipes, took some holidays and here are the results. 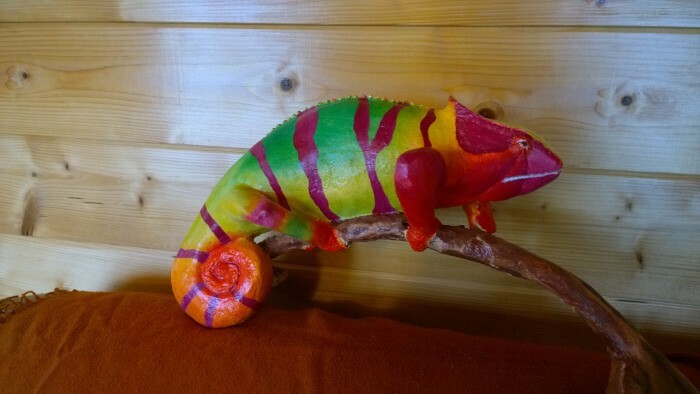 My first finished sculpture is a chameleon. 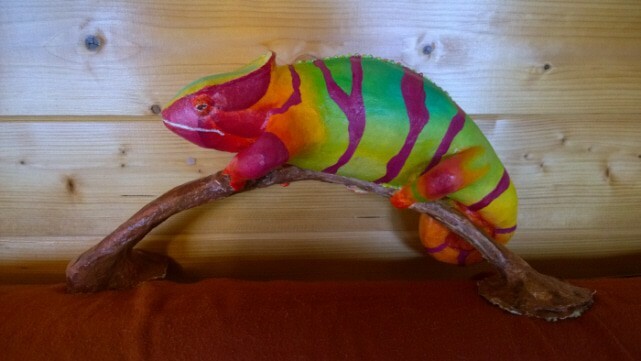 Now that my chameleon is nearly done, the next sculptures are a flying parrot, a squirrel, an iguana and a pink flamingo. I have some issues to make the flamingo’s legs. I’ve made them apart from the body because it’s really heavy and I want to empty it before attaching the legs. If anyone knows how I can pull this off, it would be really great. 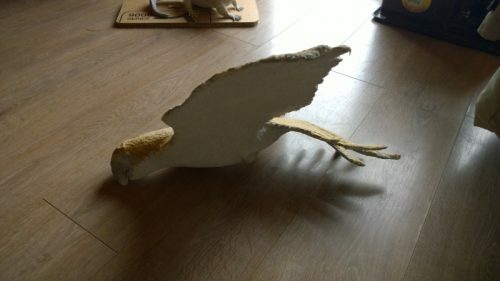 I made the legs apart from the body, and I made their armature with a very thick piece of cardboard (maybe 2cm), it’s very strong but when I put the paper paste on top of it, the legs become too big and look awful. Perhaps I should use a big piece of wire, make the legs with it and attach it inside the body before gathering the different parts… Suggestions, anyone? Have a nice day everybody, and thank you for sharing your experiences, it really helps!! I love your work! Thank You for sharing! I have a question about your flamingo. I was wondering how you constructed it, you mentioned it was heavy? 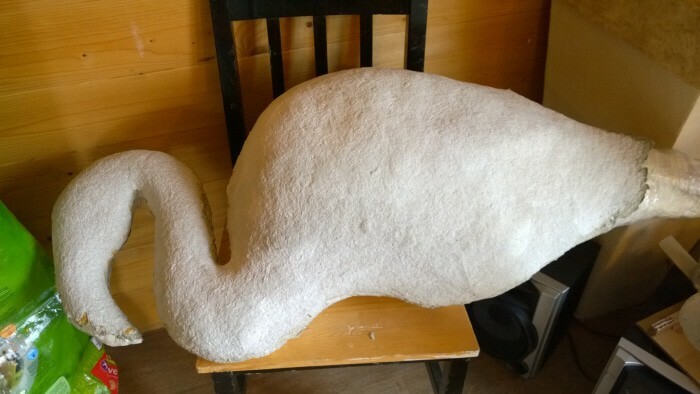 We are making a flamingo float for a cardboard box derby so I just curious to see how you made your flamingos body…As for the legs could you use 1/4in pvc piping and fill it with plaster? I hope you’ll show us your flamingo float when it’s done. Hey… I just found you on line. Lots of good information. Thx for helping all of us create with paper mache. Here’s a sample of my work. Looking forward to trying out some of your tips. Hi Deborah. Your image didn’t come through with your comment, but I checked your website and you do amazing work. Would you have any interest in doing a guest post for us some day? I enjoyed looking at the photos and is inspired. I am trying to find on how to make a flying pterodactyl – not necessarily a life-sized but good size to elicit responses from young kids. Hi May. I’ll bet you’ll find some inspiration on Dan Reeder’s site. His sculptures are lightweight, but strong enough to hold up well. 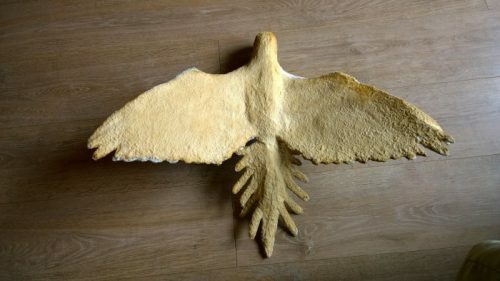 His book has step-by-step instructions, and gives you everything you’d need to make your pterodactyl. If you make one, I hope you’ll come back and show it to us. I’d love to see how it turns out.